Achieve wellness in every aspect of your life. Stay in peak health with delicious, nutritious meals, state-of-the art fitness facilities, scheduled classes and activities, and on-site preventative care. Good physical health is integral to your overall wellness. Keep your mind sharp and curiosity satisfied with organized activities such as writing (residents publish a monthly newsletter as well as a quarterly literary magazine); reading books from our well-stocked library; bridge, card and board games; and Great Books classes taught by St. John’s College tutors, to name a few. Support and engage your community of neighbors and friends on a daily basis. 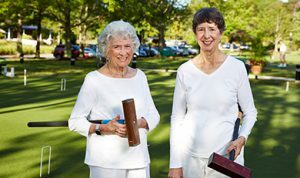 Social interaction is promoted through enriching, diverse scheduled activities and programs, as well as our 40-committee Residents Club, which offers numerous opportunities for engaged participation. Share memories, experiences and feelings with those closest to you. At Ginger Cove, you’ll have those kinds of friends. And our professional, licensed social workers are always available to help, privately or in one of their meaningful classes. Practice your faith at our interdenominational services. Center yourself through mindful exercise. Commune with nature by tending to your garden bed. These are just a few ways you can nurture your spiritual health at Ginger Cove. Enrich your days with a range of stimulating and rewarding pursuits at Ginger Cove. Volunteer on a committee, share your skills, talents or hobbies in classes, or mentor a new resident — just a few of the opportunities to improve your vocational health. Promote your environmental health by helping to maintain our beautiful waterfront campus. Help to plan and plant in our woodland garden or assist construction and placement of bird houses around campus. As a community, we strive to reduce our impact on the world through sustainable practices such as recycling and the use of eco-friendly products.